Urban Green Rural Blues is the 2014 theme of Stichting RUW. The opening event will be January 21 with lectures and a debate on how the future city will look like. From 19.00-21.00 in the Public Library (BBLTHK), Stationsstraat 2, Wageningen. Free entrance and free drinks afterwards. Since 2008 more people live in cities than in rural areas. The world population is growing and urbanisation is expected to continue. As a result, pressure on urban areas is increasing with growing issues and challenges; concerning the urban environment, waste management, traffic, housing and food supply. At the same time, cities are vibrant hubs of creativity where inspirational and successful ideas for a green, clean and healthy living environment emerge. How can we envision the future of the city? And that of the countryside? How are urban-rural landscapes, communities and relations changing? Join us at our opening activity on the 21st of January to find out! Rutger de Graaf (TUDelft, DeltaSync, Blue Revolution) will explain why we need to start building on water and Jan-Willem van der Schans (WUR, LEI) will discuss the role of urban food strategies in building a sustainable city. 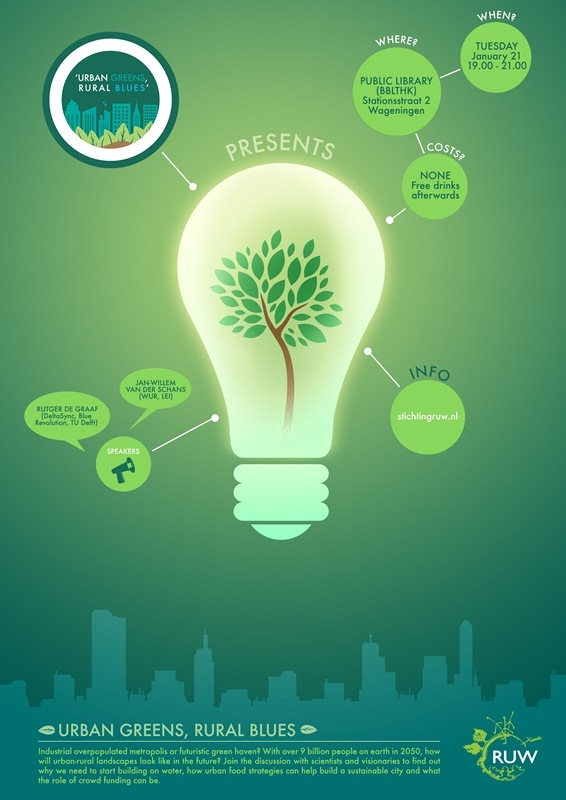 Elma Schoenmaker (BelW climate-green design) will show us several eco-smart, climate-adaptive and bio-mimicry designs.